1. The need for making a shelter in mountainous terrain should always be anticipated before the start of any mountain work or a trek. In mountains, the knowledge of making a shelter becomes especially important because of the harshness of the climate, lack of inhabited places coupled with the difficulties imposed by the operational situation. Due to these reasons a shelter is required to be made out of the natural resources available in mountains and snow bound terrain. Knowledge of making a shelter will allow the mountain climber to preserve their mountaineering capacity in adverse weather conditions. 2. 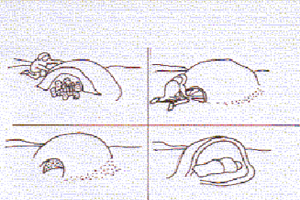 Shelters can be classified as standard and improvised shelters. (a) Tent Arctic Small. This tent can accommodate two persons and the weight of this tent is 10 Kgs which can be easily carried by two persons with their personal load. (b) Tent Arctic Medium. This tent can accommodate 10 to 12 people. Weight of this tent is tent is 72.5 Kg which cannot be carried man pack. (c) Other tents. A large variety of tents are available in market for mountaineering and tracking purposes. (a)	Shelters Built with Branches. This type of shelter is ideal upto tree line. One must not cut down the trees, but use the branches or dry trees. The floor of this shelter will be covered with dry leaves and branches. The branches to form the cover must be placed like the tiles on a roof and must be thick enough to provide the necessary shelter. This shelter must be small to keep one warm and to reduce the construction time. (i)	Single Lean-to. To save time and energy, select two trees which are close to each other and sturdy enough to support the crosspiece approximately 1.50 meters off the ground. It may be necessary to cut two forked poles of desired height, or construct two A-frames to hold the crosspieces, or use a combination of these supports when camping in sparse wooded or semi-open areas. A large log is then placed to the rear of the lean-to for added height. (ii) Double Lean–to. Two single lean-tos are built facing each other and approximately 1.50 to 2 meters (5' to 6') apart. The space between single lean-tos must be sufficient to permit the occupants to move freely around. (iii) Wigwam. A conventional wigwam or tepee can be built in wooded areas by typing a number of poles near the top and spreading them at the bottom to form a large circle. This framework is then covered with available tree boughs, canvas, cardboard, or other suitable material. (i) Igloo. It is the most comfortable snow shelter. Its ideal capacity is for three men, with interior measurements of approx 2m dia and 1.5m high in the centre. The approx construction time is about 2 hours. It is constructed by first compressing the snow of the floor. Then ice blocks are prepared by compressing the snow and cutting the blocks with a saw or a shovel. Once the blocks are made ,they are placed sideways in rows around the floor which has been prepared by compressing the snow. As the blocks are placed snow must be compressed between them to help them to weld together. (ii) Emergency Igloo. It is built in the face of an abrupt change of weather. 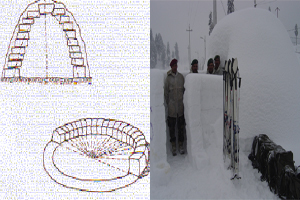 An Indian tent is made with the equipment, it is covered with the ponchos and snow or blocks are placed on the top of it. It would be necessary to improve the shelter in case the bad weather persists.